There are literally thousands of online directories that offer a free local directory listing. Each one provides different features, benefits, look and feel. Many will also solicit you to upgrade to their paid advertising option. Projects Plus is not affiliated with these directories – we leverage ‘free’ to maximize your results. If you find yourself interested in paid services for particular local business directory listings, please consult with us before signing any contracts. We will help you make an informed decision that protects your online presence and your budget. It is crucial to continually increase the number of your listings and provide the search engines with fresh content about your business – beyond just name, address, phone (NAP) – such as project photos, business hours, optimized business description, categories, services, etc. Google regularly scours the internet looking for exact matches of your business NAP. The more matches they find, the more trust and confidence they have that you are, who you say you are, and the more you are rewarded with rankings and visibility for numerous search terms. It's a popularity contest. You want to have the most, highest quality listings as compared to your competitors at all times. The consistency of the business details in your listings is crucial. If your business details are not uniform (i.e. different phone numbers, varying formats of your business address), the search engines may consider that listing a different business or otherwise dilute/diminish your online exposure. The quality of your listings is another vital factor. For instance, there are a lot of garbage websites out there that Google considers spam. These spammy directories will harm your online presence. Projects Plus researches all the directories we list your business in and carefully discern quality. Please ask us for feedback before listing your business in a directory that may be questionable. Some local directory websites are national, or even international. They just drill-down to local areas. Hyperlocal sites are those focused solely in your service areas such as the local Chamber of Commerce, local Meetup or BNI, local sponsorships, education or government institutions. These are highly effective. Though Projects Plus researches listing opportunities for you in your local market, many of them are unavailable unless you participate or advertise with them in some way. 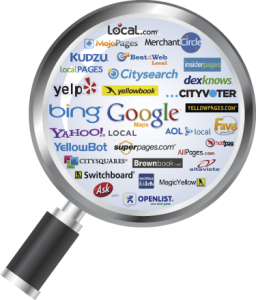 Always be on the lookout for opportunities to be listed on local websites in your communities. Run them past Projects Plus first to ensure quality and/or provide us your login credentials so we can optimize your listing profile. Industry niche directories (i.e. Zillow, Houzz) establish you as an authority in your field – earning you more power as a dominant business in your online category. It also puts you in front of more customers searching for your services. Again, Projects Plus researches and lists you in industry niche directories as available. We recommend getting our input when you find these types of directories on your own. 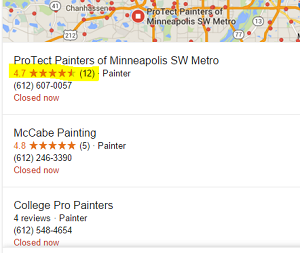 Google frequently updates their local business product. In addition, ongoing troubleshooting and optimization are necessary to improve and/or maintain your rankings. This Google local maps section of a search results page is your most valuable ‘real estate’ on the internet apart from your website. Learn more about Google’s free business listing product here. Many of your other top local website listings require attention on an ongoing basis – whether it’s updating content, adding project photos, or upgrading to a directory’s latest change or new feature. This is the management portion of Projects Plus local directory listings services that save you a lot of time and keeps your business in the spotlight across the web. When you list your business anywhere online, use the EXACT business name, address, and phone number as is listed on your website. There may be times when you must use a different phone number for tracking purposes – but this should be rare and it would benefit you to discuss possible options/alternatives with Projects Plus.